There is a very interesting quote by Beth Comstock, Vice Chair – GE. Marketing has always been about getting attention. As more businesses realise the power of Digital marketing, there is still great anxiety around ways the digital ecosystem can be best used to effectively market a brand. Every brand has a story. Success in marketing your brand is all about effective storytelling. With the changing landscape, its important and yet challenging to be visible and noticed in the crowd. Brand building hasn’t changed, but the medium has. Several factors decide the positioning of a brand. Positioning could revolve around price, quality, customer aspiration, joy, sensitivity and several other components that touch human expectations. It is hard to measure. Your brand should stand out differentiating you from your competitors. Content needs to be honest, subtle and should signify the USP of your brand, it needs to resonate with the customer. Popular third party sites can make your break your brand. If you are a restaurant, ratings on a site like TripAdvisor can have a significant impact on your business and the brand as a whole. Back in 1982, Nestle launched Maggi in India through a “2 minute noodles” branding that was path breaking. It conveyed the idea of quality fast food with a tagline ‘Easy to cook and good to eat’. It eventually created a new segment of instant noodles in India focusing on kids and their moms. For over two decades, Maggi has become synonym with instant noodles despite the competition. It goes without saying that your website is your biggest digital asset. In today’s digital world, your website can make or break a potential business opportunity. Your website coupled with blogs should not be considered as an expense or an afterthought as most small and medium businesses often do. Your website needs regular feeding of information and nurturing from time to time. Search engines do not like silent websites. The more the information available, the greater the chances are that Google algorithms will search your site and index it for new content. The best way to keep updating content is having a dedicated blog section which is updated with content that helps keep your prospective customers informed. If you optimise your site, Google will drive traffic to your site. Once you’ve grown the grass and attracted the horse, you need to make sure he eats the grass too. Therefore, make sure you have what is called as ‘call to action’ by providing the potential site user dial a phone number or fill up a form to express any expression of interest. This will help generate a lead for you. Adding videos and chat helps increasing the engagement. Content defines your online presence, period. Content curation and sharing in any form, text, video or graphic if presented in a way that influences a thought and leaves a perception helps build equity for your brand. Once you build content, it needs to be shared and distributed across the web to different corners of cyberspace to get it crawled and indexed by search engines. Such content eventually gets shared on social networks and helps increase outreach. The challenge always is to curate content that is unique and is garbed in storytelling through statistics or scenarios that influences the reader. In a nutshell, you are creating readership for your content that will help increase followers. In addition, you need to cajole and nudge readers through tweets, short LinkedIn posts, Instagram updates. 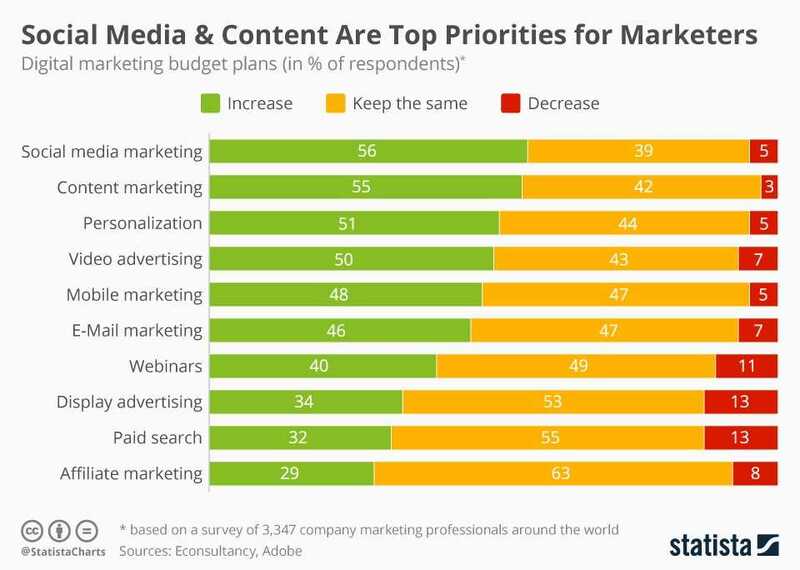 Content needs to be ubiquitous. Visual content in the form of infographics and short videos go a long way in tapping into audiences. Here is an example of great storytelling by Google through one of its videos that ran a couple of years back on television. Through its search engine, it is trying to make the world a better place by helping them solve their problems. It is telling them what people can do with technology. Storytelling with an emotional connection and humour always works with audiences. 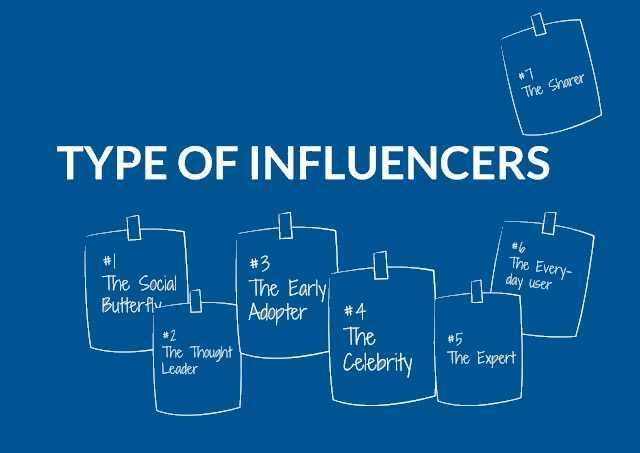 Social influencers are people who have built a personal brand online around their passion within their respective field of interest. They have been able to build an online reputation and credibility with a band of followers through years of publishing and promoting content in their niche. Their endorsement of a topic, product or a service can go a long way in influencing the brand they are endorsing. They have great distribution powers on social media. Some of these people could be journalists, celebrities, social media sensations, tech geeks, practically anyone. Someone influential talking about you will have a greater effect than you blowing your own trumpet. When looking for a social influencer its important to do your research and find out how engaged are their followers. Just having large number of followers is not enough. Its important that their core values align with your brand. It’s important to build a good relationship with the influencers and provide them their creative space. 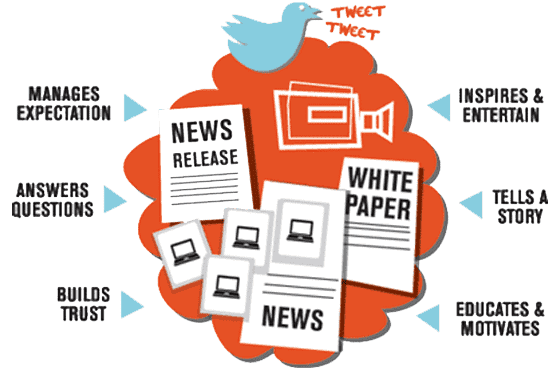 Marketing using the social media has always had divided opinions as there is an afterthought tendency for negative publicity going viral, possibly based on rumours, something that can really tarnish a brand image overnight. Many CEOs ask this question “How does social media help me make a sale ?” The answer to that is, “No, it doesn’t make a sale”. Social media helps you build awareness among the mass, giving you the ability to selectively target your audience, building and staying in touch with your potential customers. Social engagement in the form of new product launches and response to customer problems for your product on social media go a long way in building a loyal customer base. A satisfied and happy customer will be your unpaid salesman and will make the next sale for you. Therefore, marketing on social networks needs to be looked at in a larger perspective. 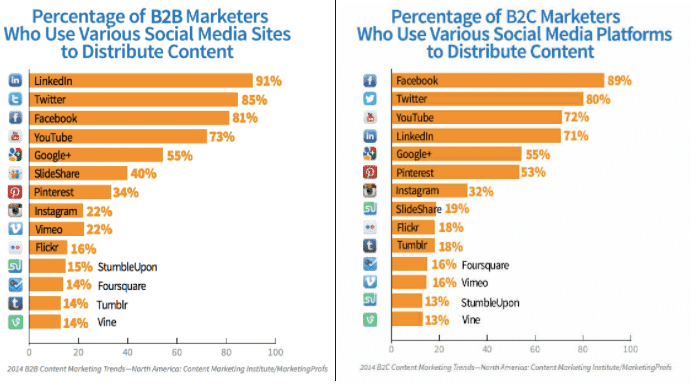 From the graphic above, the statistics show that LinkedIn has been the most successful platform for B2B marketers while B2C marketers prefer Facebook. The priority on deciding the platforms depends on the product, service and the audience you want to reach out to. 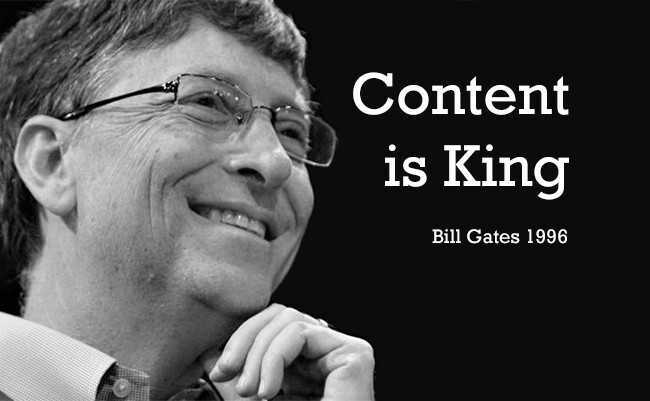 While content is the King, Data is the King’s most trusted ally. Data helps you measure the impact and results of a digital marketing campaign. In this digital world, Data is the most valuable asset as it gives you insight to every aspect of your site and content’s performance. It tells you which content is being read more and the pages that need better optimisation. It gives you a complete analysis of how visitor traffic is on your site and each of the pages thereby giving you the ability to align your strategy. If you are selling products , you can analyse the clicks and sales of your products using all the data captured. Analysis of traffic and trends helps you measure the spend and ROI in digital marketing in the long run. Increasing outreach across the web is the basic fundamental when marketing in the digital ecosystem. Apart from content distribution through owned channels or mediums like website blogs, email, social media etc. there are paid channels that charge a fee for distributing your content. Cost per click (CPC) is one such model where the author of the content pays a fee for every click through of the content. The other distribution channel is through third party distribution in the form of press coverage, paid product reviews etc. There are no short cuts to digital success. For business owners and decision makers, those who understand the possible returns in investing in the above assets stay invested for the long term. Marketing in the digital domain requires patience and a process that helps build credibility for the business by staying invested in the above assets. The digital world is here to stay and grow immensely. Start today – if you haven’t.